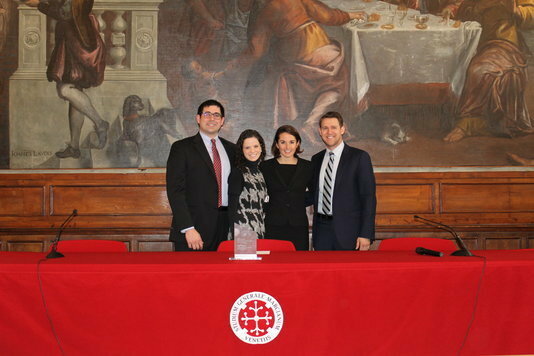 Four Notre Dame Law School students recently won an international law and religion moot court competition in Venice, Italy. Sponsored by the Program on Church, State & Society and the Nanovic Institute for European Studies, eight Notre Dame Law students participated in the 2016 Fondazione Studium Generale Marcianum Moot Court Competition on Law and Religion. Notre Dame’s Moot Court Board team—consisting of second-year law students Matthew Ciulla, Christina Dines, Kyle Maury, and Christina Milanese—took first place. A team consisting of third-year law students John Foerster, Will Hodges, Christina Shakour, and Laura Wolk also competed. According to organizers, the competition brought together seven teams of law students from the United States and Europe to argue a case on religious accommodation, examining issues of religious freedom through a comparative lens. Students came from national and international law schools around the world and participated as teams to deal with a case concerning the complex relationship between law and religion. Representatives of Fondazione Marcianum said the initiative intends to bring together scholars and students of different backgrounds to address the very same case from two different standpoints. Some scholars act as judges of the Supreme Court of the United States and others as judges of the European Court of Human Rights. Teams argue the same fact pattern before one of the two boards of judges. After the final judgment, the scholars and students participate in roundtable discussions, debating the case and the way it was addressed before the different courts. In addition to testing their advocacy skills, participants of the competition were also able to compare the different cultural points of view of the two courts. Originally published by Lauren Love at law.nd.edu on April 13, 2016.